Peterborough United manager Steve Evans has challenged his under-employed squad members to force their way into the first team by playing well in tomorrow’s Checkatrade Trophy tie at MK Dons (September 4, 7.45pm). Evans will make wholesale changes to his starting line-up, as many as the competition rules allow, which means the likes of goalkeeper Conor O’Malley, defenders Darren Lyon and Josh Yorwerth, midfielders Louis Reed, George Cooper and Callum Cooke, wingers Marcus Maddison and Isaac Buckley-Ricketts, striker Ivan Toney and latest signing Jamie Walker all have a chance of being involved at Stadium MK. Latest Posh signing Jamie Walker. Photo: Joe Dent/theposh.com. 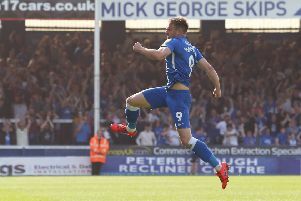 Posh have kept the same starting line-up for the opening six matches of the League One season, but their standards dipped badly in Saturday’s 1-1 draw at home to Doncaster. Posh were lucky to get out of the game with a point that kept them top of the League One table. “I want to win the Checkatrade Trophy,” Evans announced. “But I want to win promotion from League One much more and that means getting some competitive match time into the players who haven’t been involved much so far this season. “We will make changes, but we will still be fielding a strong, competitive side and the challenge for those involved is obvious. “If they want to get into the League One team they need to play well at MK Dons. They have to make me want to pick them at Southend this Saturday. Posh striker Ivan Toney could start at MK Dons. Walker is expected to start following his transfer deadline day arrival on loan from Wigan. “Jamie is a class act,” Evans added. “He has scored against the biggest clubs during his time with Hearts which is why Wigan paid big money for him. Midfielder Callum Cooke could be involved for Posh at MK Dons.